WHEW! What a Sunday! I can’t believe all of the fabulous people that joined me this weekend for the Game Day Mystery Make-along. You blew my socks off in the amount of people that showed up and the amazing finished projects. I truly hope that you all had fun and look forward to doing this again. Before we put this one in the books I wanted to look back at what went well, what we learned, and most importantly…who WON! Just incase you missed the whole thing lets go over what I am talking about. This year for the Super Bowl we thought that we would have a little fun and have a mystery make-along. We had two patterns ready for you, one in knit and one in crochet. We didn’t tell you anything about the pattern before we started other than the materials that you needed. If you haven’t started your own Game Day Mystery Make-along you can head to the original blog post to get more information and to see where each clue is posted. You can image how excited I was that over 3,000 of you signed up to join the event but you can’t even image how panicked I was the minute we realized that we crashed the server with the number of people trying to get to the blog for the first clue. Thank you to everyone that stuck with us throughout the day. This was a total learning experience for me and my team but I think we got through it with some confidence in the end. Most importantly I would like to make sure that you all think about what you accomplished on Sunday. Many of you finished an entire project in 6 hours. Yes you read that correctly SIX hours!!!! Over 500 of you finished during the day and posted pictures in the finished thread. Just AMAZING!!!! I hope that you are all resting up today and have ice on your wrists! I can’t have an accomplishments section without mentioning that with all of the sharing that you did we were able to DOUBLE the size of our Facebook group! How awesome is that, thank you for getting the word out there. I couldn’t have done it without all of you! There were some comments in the group that people had never finished a project in one day before! The amazing work that was done just made me appreciate my group even more. Best of all we saw a few mother daughter teams in the group. How touching to see the groups of mothers and daughters working on the same project to finish with matching cowls at the end. Browsing on Ravelry, in the two minutes I had all day between answering questions, I saw that we hit the Hot Right Now list on Ravelry for BOTH patterns! OMG!!! Thank you so much to everyone for putting these patterns in your library, starting a project for them and adding them to your favorites. You don’t realize how much that means to me. Before moving on to what we learned from this experience I would like to give a shout out to the pets and husbands that were wonderful models for this event! We loved seeing all of the finished projects but those really stuck out. We heard that this even became somewhat of a family ordeal as family members were waiting to see what would happen in the next section! I have to admit that the funniest photo that we saw was from Sandra who posted her attempts at figuring out how to wear her finished cowl. I must say wearing it as a hat might just lead to the next trend. Thanks for being great sports and trusting the process and just enjoying working the yarns and your hooks/needles. Let’s be honest, the first time you attempt something you always find the gaps in your plan. We found a few in ours as well and have made notes to figure this out for next time. Some of the things we learned were that we have to change our server to be more robust so that it doesn’t crash on us again. I don’t know how many people didn’t come back once they saw that they couldn’t get to the site. We want to make sure that you can get to the clue when you want to. We will work on this ASAP and are so sorry that you had to wait! Next time, when we have a knit version, we will give the knitters some more time to work. We promise not to have a one day KAL!!! In theory it sounded really good that we could give out the different clues each hour and have it finished in one day. We quickly realized that we were a little optimistic on the knit version. Trying to keep the pattern basic with texture so that the stitches would go faster didn’t work quite as planned. Please accept our apologies knitters and know that we are thinking of you for next time. With so many of you jumping right in at the first clue we noticed that there were quite a few questions. We love that you were excited and wanted to get things right but what we didn’t like is we felt that we were missing your questions. Next time around we will have a separate post for each clue so that you can leave your questions there. This will help you find answers to the questions and will allow us to find them easier. You all were amazing with helping each other out as you saw questions coming through, thank you for being so kind to each other. We heard you asking for videos to the different stitches and some we didn’t have the exact video for. This was meant to be a quick project and one that we didn’t have the resources to spend in making videos. 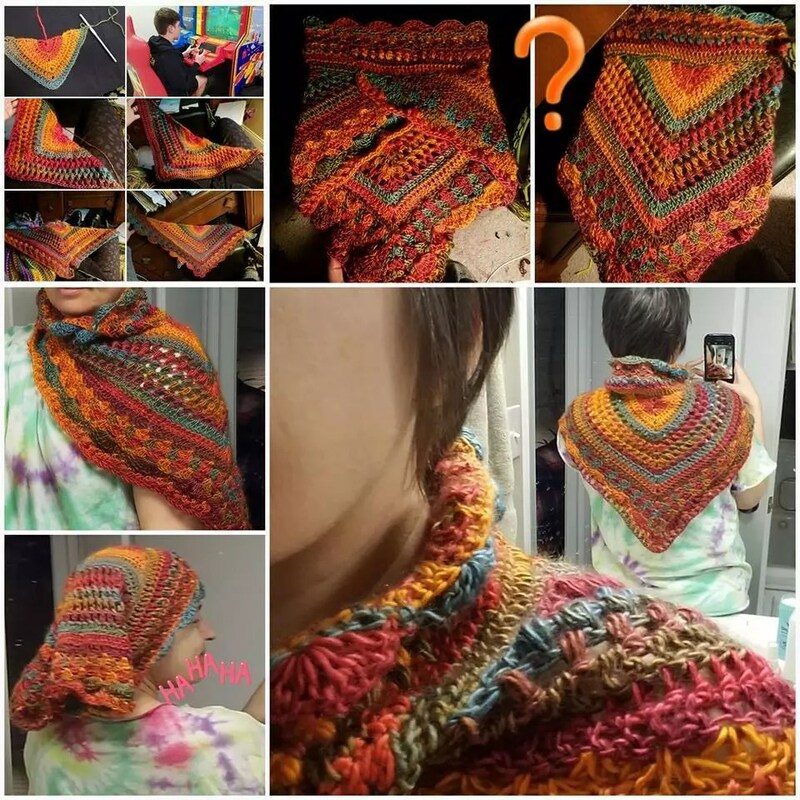 Please join us for the BIG KAL in spring and CAL in fall that are sponsored by Red Heart for full directions and videos of every step of the pattern. The Spring KAL will be starting at the end of March, be sure to join the KAL group so you don’t miss the start. Although the Game Day Mystery Make-along pattern will be available forever for FREE on the blog it will stay broken out by clue. You can purchase an inexpensive ad free PDF of the each pattern in my Ravelry store. Once again I would like to say thank you to everyone that joined us and participated! Below you will find the SIX winners we had of those of you that finished your project and posted in the correct post in the FB group. Congratulations to our prize pack winners! If you see your name on this list you have 48 hours (2/7/18 at midnight MST) to send an email to submissions@marlybird.com to claim your prize. Please put “Game Day Mystery Make-along” in the subject line and include your full name, mailing address and phone number. Only US and Canada addresses will be accepted. Congratulations everyone! I had so much fun! Thank you Marly and crew for making it a learning experience to boost the confidence level. Congrats to the winners and a big thank you for the fun to be had during the day and THE game! Have plans for a few of these to make it to the Christmas presents for 2018……never too early to start…..
Congratulation, Marly and team for winging it for us. As frustrated as many may have been, I know the pressure was really on you all. You did splendidly and were able to wing it through 3000 people dependent on you. Job well done for you, too! Thank you for the pattern you gave me and for the Game Day Mystery project. Congratulations to the RH yarn winners and to all of us; for we each have a new item to give or keep in our closets/drawers. We really were ALL winners. I hope this where I comment for the yarn give away. I pick the single crochet entrelac class. Thanks!